Mike Kanellis makes his 205 Live in-ring debut against Lince Dorado, and Mustafa Ali faces Hideo Itami in a Falls Count Anywhere Match on a very good 100th episode of 205 Live. A great fatal five way match main events a show that also featured the apparent teaming up of some bitter rivals. Mustafa Ali finally gets his rematch with Hideo Itami, Lio Rush takes on Noam Dar in a fun match, and Brian Kendrick might have set the record for shortest match ever on 205 Live. 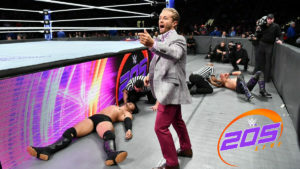 Buddy Murphy takes on Kalisto in a great main event on a 205 Live where Akira Tozawa and Brian Kendrick renewed their rivalry and Mustafa Ali returned! 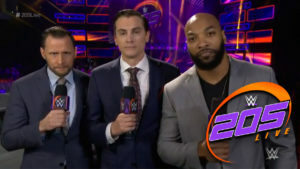 Cedric Alexander endures a tough match with Jack Gallagher just days before Summer Slam, Akira Tozawa attempts to shut the mouth of Lio Rush, and Hideo Itami demands more respect on a good episode of 205 Live. Itami attempts to beat some respect into Ali, and Murphy and Nese try to silence the Lucha House Party on a good episode of 205 Live. Hideo Itami makes his intentions known on a good episode of 205 Live. Hideo Itami and Akira Tozawa settle things in the ring after weeks of disrespect.